Prince William’s spilt the beans on one of George, Louis and Charlotte’s favourite books, and chances are it’s one you’ve got tucked away on your family’s bookshelf! 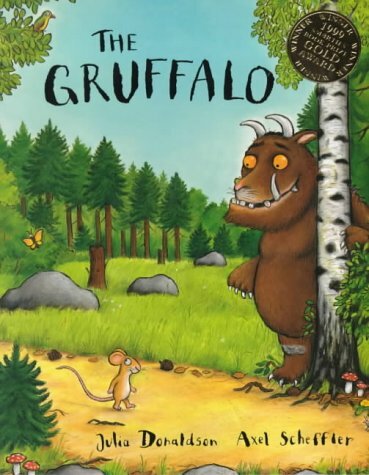 “The proud dad revealed The Gruffalo was ‘a hit’ with his young children, as he met with the book’s author Julia Donaldson and illustrator Axel Scheffler at The Tusk Rhino Trail outside his home at Kensington Palace,” Hello! Magazine reports. The Tusk Rhino Trail is an interactive art installation which aims to raise awareness of wildlife conservation and World Rhino Day. Twenty-one rhino sculptures lurk in prominent places in London, all decorated by notable types, including this royal approved one right outside Kensington Palace. Inspecting this colourful, illustration-emblazoned rhino, Prince William was keen to strike up a conversation with its creators. “I know who you are. It’s a big hit in our household, The Gruffalo,” William reportedly told Julia and Axel, explaining the family could see their rhino when he looked out the palace windows. George and Charlotte were already confirmed animal lovers, so this news that they have been merrily admiring the Gruffalo rhino from this privileged vantage point comes as no surprise. Charlotte shares a love of horses with her great-grandmother the Queen, while George is firm friends with the family’s good boy doggo, Lupo and is also a keen dinosaur fan.